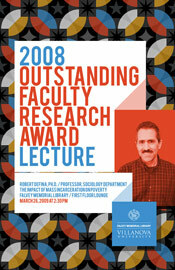 Robert DeFina, Ph.D., professor of sociology, is the recipient of the University’s 2008 Outstanding Faculty Research Award for his work, The Impact of Mass Incarceration on Poverty. On Thurs. Mar. 26, Dr. DeFina will share his work, from 2:30 to 4:00 p.m. in the first floor lounge of Falvey. One of the most pressing social problems of the last thirty years is the persistence of poverty in the face of overall economic growth. Researchers have examined a variety of possible causes including de-industrialization, lower minimum wages, de-unionization and technological change. However, much remains unexplained. Join Dr. DeFina as he presents his research on the potential influence of the dramatic rise in incarceration rates of the last three decades. His work explains possible ways that mass incarceration can contribute to poverty and describes empirical work suggesting that the actual effects have been substantial. Dr. Defina teaches courses on social inequality; perspectives on US poverty; work, wages and inequality; comparative social policy; and the social safety net. His research primarily focuses on the causes and consequences of poverty and social inequality. The presentation will be of particular interest to students in sociology, criminology and political science. However, “the fact of mass incarceration, the reasons for it and its implications are issues of general importance, and so the talk will be of interest to a much broader audience,” explains Dr. DeFina. This event marks the last installment of the Scholarship @ Villanova Series hosted by Falvey this spring semester.